I am grateful to Gian Paolo Romano, Production Editor of the Yearbook of Private International Law, for providing this presentation of the new volume of the YPIL. 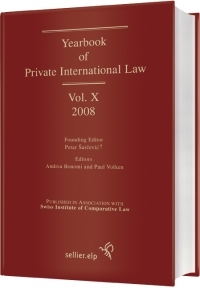 Volume X (2008) of the Yearbook of Private International Law, edited by Prof. Andrea Bonomi and Prof. Paul Volken, and published by Sellier Euro­pean Law Publishers in association with the Swiss Institute of Com­parative Law (ISDC) of Lausanne, was put on the market last week. Volume X, which celebrates the tenth anniversary of the Yearbook, is made up of 35 contributions on the most various subjects authored by scholars and practioners of almost all con­tinents. Its 743 pages make him one of the most considerable collections of PIL essays in English language of recent years. The volume may be ordered via the publisher’s website, where the table of contents and an extract are available for download. The Doctrine section in­cludes three contributions concerning the Euro­pean judicial area: a first on the revised Lugano Convention on ju­risdiction and the recognition and enforcement of judgments of 30 October 2007, a second on the European jurisdiction rules appli­cable to commercial agents and a third on the recent decision of the European Court of Justice in Grunkin-Paul, a seminal case that opens new perspectives for the application of the recognition principle as opposed to classical conflict rules in the field of international family law. Other original contributions concern damages for breach of choice-of-forum agreements, accidental discrimi­nation in conflict of laws and the recent Spanish regulation of arbitration agreements. Two Special sections of this volume are devoted, respectively, to the EC Regulation on the law applicable to contractual obligations (Rome I) and to the new Hague Convention and Protocol on maintenance obliga­tions. In addition to several contributions of general nature, the special section on Rome I includes detailed analy­ses of the impact that the Regulation will have on the connection of specific cate­gories of contracts (contracts relating to intellectual and industrial property rights, distribution and franchise contracts, financial market and in­su­rance con­tracts), as well as some remarks from a Japanese perspective. The special section on maintenance obligations includes insider commen­taries on the two instruments adopted by the Hague Conference on 23 November 2007: the Convention on the International Recovery of Child Support and other Forms of Family Maintenance and the Protocol, which includes rules on the law applicable to maintenance obligations and aims to replace the 1973 Hague Applicable Law Convention. The National Reports section includes the second part of a detailed study on private international law before African courts, a critical analysis of the new Spanish adoption system and of the conflict of laws issues raised by the Panama­nian business company, two articles on arbitration (in Israel and Romania), and several contributions concerning recent developments in Eastern European coun­tries (Macedonia, Estonia, Lithuania and Belarus). Africa is also at the centre of the report on UNCITRAL activities for international trade law reform in that continent. The section on Court Decisions includes – together with commentaries on the Weiss und Partner and the Sundelind López decisions of the ECJ – de­tailed analyses of a recent interesting ruling of the French Cour de cas­sation on overriding mandatory provisions and of two Croatian judgments on copyright infringements. The Forum Section is devoted to the recognition of trusts and their use in estate planning, the juridicity of the lex mercatoria and the use of natio­nality as a connecting factor for the capacity to negotiate. Benedetta Ubertazzi, The Inapplicability of the Connecting Factor of Nationality to the Negotiating Capacity in International Commerce.